I'm starting to leave my house and going places where you can find me. I even put on a dress sometimes, but only if it's required. Click the links to get tickets or more information. Most events require the advance purchase of a ticket. Get more details and purchase tickets through the EVENTS tab on my Facebook page. Click each city to take you to its own EVENT page. 2nd - Kansas City, MO - Books in the Bottoms - I will be at Serendipity, 1300 W. 13th St., from 10 am - 2 pm. 7th - Miramar/Pembroke Pines, FL Chamber of Commerce - Membership is required. 27th - Madison, WI - Open to the public, tickets are required. 28th - Madison, WI - University of Wisconsin Women in Business - Membership is required. 15th - Plano, TX - Open to the public, tickets are required. 29th - Minneapolis Rotary Club - Membership is required. 30th - Rotary Club of Orono (morning) - Membership is required. 30th - Hudson, WI Rotary Club (afternoon) - Membership is required. 30th - River Falls, WI Public Library (evening) - No ticket required. 5th - North Kansas City, MO: Mid-Continent Public Library - Woodneath Location: 10 AM - 1 PM Holiday Open House - I'll be selling and signing books. 5th - Stillwell, KS: theRYEstudio - 4 PM - 6 PM Holiday Shopping Event - I'll be signing books. 9th - Kansas City, MO: Kansas City Public Library Main Branch - 6:30 PM Spending the Holidays with People I Want to Punch in the Throat Event. I'll be speaking and signing books. 13th - North Kansas City, MO: Mid-Continent Public Library - Woodneath Location: 7 PM. 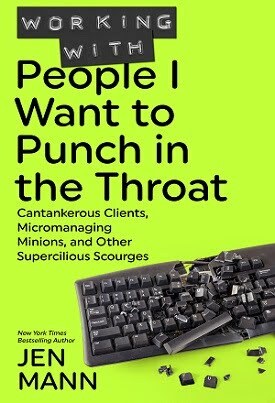 Book Launch Event for Spending the Holidays with People I Want to Punch in the Throat. Registration is required, so click here to sign up and join me for a hilarious night! 14th - 16th - Boise, ID: Idaho Writer's Guild Rendezvous - Featured Speaker. 30th - Calabasas, CA - Book signing at the Calabasas Library. 1st - North Kansas City, MO: Mid-Continent Public Library - Woodneath Location: 7 PM NanoWriMo Wrap Up Celebration. You finished your 50,000 words, what's next? I'll tell you. 6th - North Kansas City, MO: Mid-Continent Public Library - Woodneath Location: 10 AM - 1 PM Book Fair/Author Mixer. Find more info here. 7th-8th - Charleston, SC: YallFest - Attendee/Fan girl. 25th - Kansas City, KS: Kansas City Kansas Public Library - South Branch Location: 1 - 4:30 PM Homegrown Reads Author Fair. Find info here. 25th - Overland Park, KS: Oak Park Library: 7 PM - I'll be talking about blogging, writing, and publishing. 5th - Overland Park, KS: Honey Dews Baby Expo - Keynote speaker. 1st - 3rd - Atlanta, GA: Mom Summit 2.0 - Speaker. 14 - Overland Park, KS: Mommyshop - Spending the Holidays with People I Want to Punch in the Throat book signing. I will be signing the last copies available of this book before it is changed and re-released by Random House. You want these books. They will be rare beauties worth at least 50 cents more at your garage sale. 30 - Lawrence, KS: I'll be celebrating the end of NaNoWriMo at the Lawrence Public Library. 25 - Chicago: BlogHer - Speaker - "Is Self-Publishing for You?" 6th - 8th - Baltimore, MD: BlogU - I'll be a keynote speaker and a panelist. This is a brand new conference and if you're a blogger I encourage you to join us for a great event. 5th - Lawrence, KS: Public Library Moms' Night Out Event: 7 PM at The Eldridge Hotel - Featured author and speaker. RSVP HERE. 9th - Kansas City, MO: Kansas City Public Library (Central Location) - People I Want to Punch in the Throat: Competitive Crafters, Drop-Off Despots, and Other Suburban Scourges Book Launch. Come out and join me to launch my new book! RSVP HERE. 16th - Chicago Metro: Anderson's Bookshop, Naperville, IL - 7 PM - Booksigning for People I Want to Punch in the Throat: Competitive Crafters, Drop-Off Despots, and Other Suburban Scourges. RSVP HERE. 18th - Decatur, GA: Eagle Eye Bookshop - 7 PM - Booksigning for People I Want to Punch in the Throat: Competitive Crafters, Drop-Off Despots, and Other Suburban Scourges. RSVP HERE. What, no Chicago appearances? For shame! If you ever make it out to Boston, PLEASE let me buy you a drink!! Chicago is on the agenda now! Any possibility of coming somewhere in Maryland or Pennsylvania, south central PA?? ?